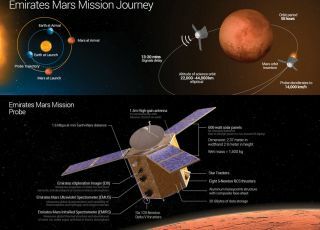 This graphic details the proposed UAE Space Agency Mars mission. The United Arab Emirates' Space Agency has unveiled its official strategy and operational plan, and it takes bold aim at Mars with a planned robotic mission to the Red Planet by 2021. The UAE Mars probe, called Hope, is slated to launch in time for the 50th anniversary of the UAE and forms a major element of the national space agency's official roadmap, which was unveiled on May 25. The UAE has already released a video outlining its Mars Hope mission. The UAE government has already invested 5.4 billion U.S. dollars in space technologies, and about 150 Emirati scientists and engineers will participate in the mission. This graphic details the journey of the proposed UAE Space Agency Mars probe. Engineers at the UAE Space Agency's Mohammed bin Rashid Space Centre discuss work on a sun shield for the Hope Mars probe, a robotic spacecraft to launch toward Mars by 2021. The probe will create mankind's first integrated model of the atmosphere of Mars. The spacecraft will collect and send back to earth over 1,000 gigabytes of new Mars data. This information will be received in the Science Data Centre in the UAE through different ground stations spread around the world. Ultraviolet Spectrometer: to study Mars' upper atmosphere and traces of oxygen and hydrogen further out into space. In a related development, France and the UAE, the UAE Space Agency and the Centre National d'EtudesSpatiales, (the National Centre of Space Studies of France) also known as CNES, recently signed a Memorandum of Understanding (MoU) to create a strategic space partnership between the two entities. The agreement represents the UAE Space Agency's first international Memorandum of Understanding with a foreign agency for partnership and cooperation in space. Leonard David has been reporting on the space industry for more than five decades. He is former director of research for the National Commission on Space and is co-author of Buzz Aldrin's 2013 book "Mission to Mars: My Vision for Space Exploration" published by National Geographic with a new updated paperback version released this month. Follow us @Spacedotcom, Facebook or Google+. Story published on Space.com.